You’ve undoubtedly heard the term “TPM” (or total productive maintenance) many times throughout your maintenance career. As Greg Folts noted during his appearance on the Rooted in Reliability podcast, people may refer to TPM as shorthand for a number of different things. Often, people are referring only to autonomous maintenance when they mention it. In reality, developing an autonomous maintenance plan is just one pillar (and the most common starting point) of building a full TPM program for a facility. TPM as a whole refers to putting processes and training in place so that everyone in a facility—from operations to maintenance to engineering—is contributing to maintenance. But what are the necessary steps for building an effective TPM program? Let’s look at each piece of the puzzle individually. Before any of the eight pillars of TPM can be put in place, a “5S” foundation must be built. The purpose of laying this foundation is to introduce the kind of standardization and processes into everyday activities that make TPM possible. Determine which items are used frequently and which are not. The ones used frequently should be kept close by, others should be stored further away. Once each of the 5S actions has been established and is part of the facility culture, it’s time to move on to the eight pillars of TPM. Autonomous maintenance (also known as Jishu Hozen) refers to “the restoration and prevention of accelerated deterioration”, which involves cleaning equipment while inspecting it for deterioration or abnormalities, identifying and eliminating factors that contribute to deterioration, and establishing standards to clean, inspect, and lubricate an asset properly. The ultimate goal of autonomous maintenance is to make it part of the operators’ day-to-day job to properly care for their assets as a form of maintenance. This pillar allows maintenance teams to address the larger maintenance issues that deserve their full attention. Planned maintenance refers to setting up preventive maintenance activities based on metrics such as failure rates and time-based triggers. Planning these activities in advance allows a facility to care for an asset at a time that will not impact production, so that uptime is maintained. This pillar involves integrating design error detection and prevention into the production process. The purpose of this pillar is to remove the root causes of defects by understanding why they occur. The idea of focused improvement involves assembling cross-functional teams to address specific issues that are occurring with equipment and coming up with solutions that consider each team that interacts with that asset. Since TPM as a concept dictates that everyone in a facility should contribute to maintenance activities, it’s important to involve each functional area in problem-solving tasks so that everyone’s unique point of view is considered. This pillar uses the knowledge that is gained through the each worker’s interactions with facility equipment to improve the design of new equipment. This allows new equipment to perform better with fewer issues, due to employee involvement that’s based on cross-functional knowledge. The training and education pillar of TPM focuses on making sure everyone has the knowledge and skills necessary to carry out TPM across an entire facility. As Greg Folts commented on the Rooted in Reliability podcast, TPM must be both cross-functionally and vertically integrated in order to be successful. Training and education place importance on managers understanding why a successful TPM program is important and filtering that knowledge down correctly. Simply put, this pillar refers to building a safe and healthy facility environment and eliminating any conditions that could be risky or harmful to facility workers’ well-being. The goal of this pillar is to provide a workplace that’s accident-free. This pillar involves encouraging people in administrative or supportive roles (such as purchasing) to apply TPM learnings and principles in their own work processes so that TPM is truly cross-functional. 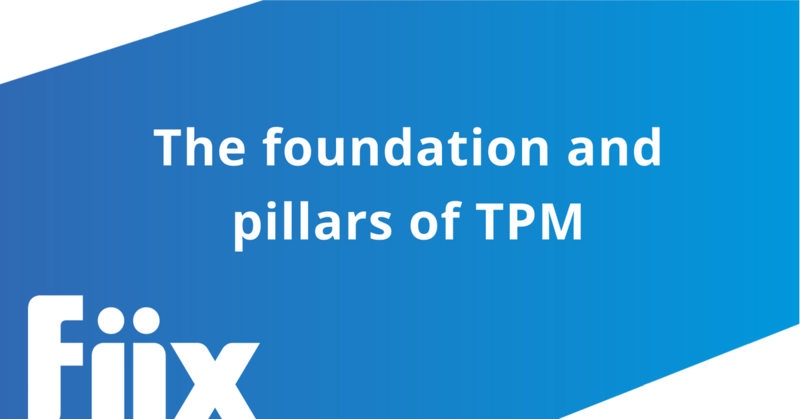 Implementing the foundation and pillars of TPM is a great start, but an important reality of any successful TPM program is that is must be a continuous effort. Every level of employee, from personnel on the shop floor to upper management, must remain dedicated to the activities that make TPM possible. Want to learn more about TPM? Read more here.